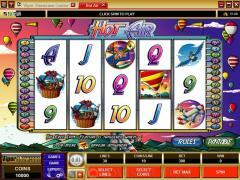 Hot Air is a 5 reel online slot game from Microgaming. It has a hot air balloon theme. The reels are set in the background of a sky dotted with hot air balloons. On the reels the Pilot is the wild symbol and the Balloon is the scatter symbol. The other thematic symbols are Telescope Man, Plane, Hamper and Bird. The symbols have been crafted in cartoon sketch style. Brightly colored high value cards from Ace to Nine also appear as symbols on the reels. Only the wild symbol and the scatter symbol exhibit animations. In the Pilot animation the shot zooms out from the close up to show the pilot in his hot air balloon. Other balloons can be seen in the background. In the Balloon symbol animation the balloon can be seen sailing over the hilly landscape. None of the other symbols exhibit any animations. They only flash when occurring in winning combinations. There is no background music in the main game, though the usual game sounds and win audio are present. However, the free spins round has a lively background tune. 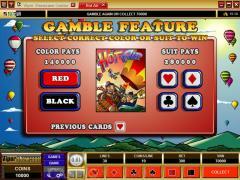 Hot Air has 30 paylines and players can wager up to 10 coins per payline. The coin denomination has to be selected from 0.01, 0.02 and 0.05. This restricts the maximum line bet to 0.50 and the maximum total bet to 15.00. High rollers will definitely not find this slot game to their liking. The Pilot is the wild symbol and substitutes for all symbols except the scatter Balloon symbol. It does not multiply payouts. Five Pilot symbols in an enabled payline result in the highest fixed jackpot of 2000 coins. Though the payouts for five like symbols in an enabled payline are not very high, many symbols start paying out when two of them appear left to right in an enabled payline. This increases the frequency of payouts. Three or more scatter Balloon symbols appearing anywhere on the reels simultaneously trigger the free spins feature. 10 free spins are awarded with all payouts doubled. The free spins feature cannot be retriggered. This free spins feature has an interesting innovation. 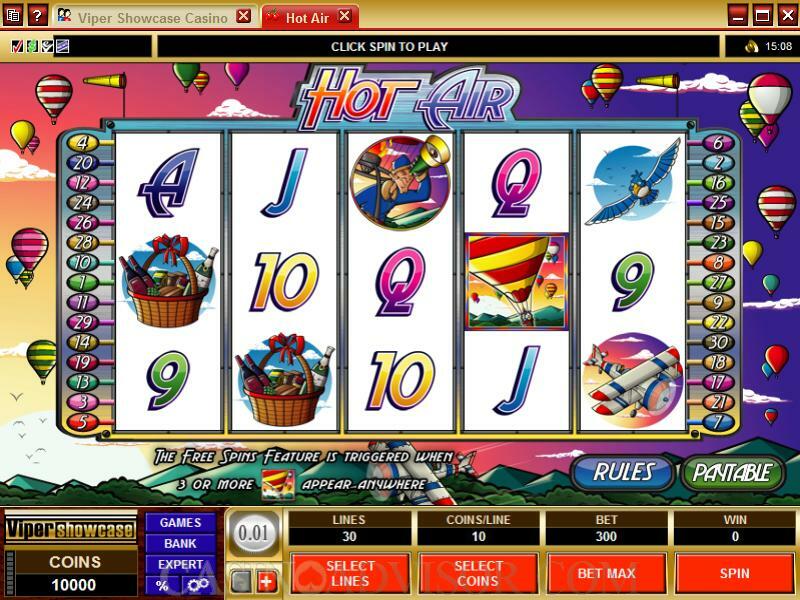 During the free spins the Pilot and the Balloon symbols are collected to enhance the value of the Hot Spins that succeed the free spins. One free spin with a multiplier of 1x is guaranteed in the Hot Spins. For each Pilot symbol accumulated during the free spins an additional free spin is given in the Hot Spins round. For each Balloon symbol accumulated during the free spins the multiplier of the Hot Spins round is increased by 1. Hot Air also offers a Gamble Game. 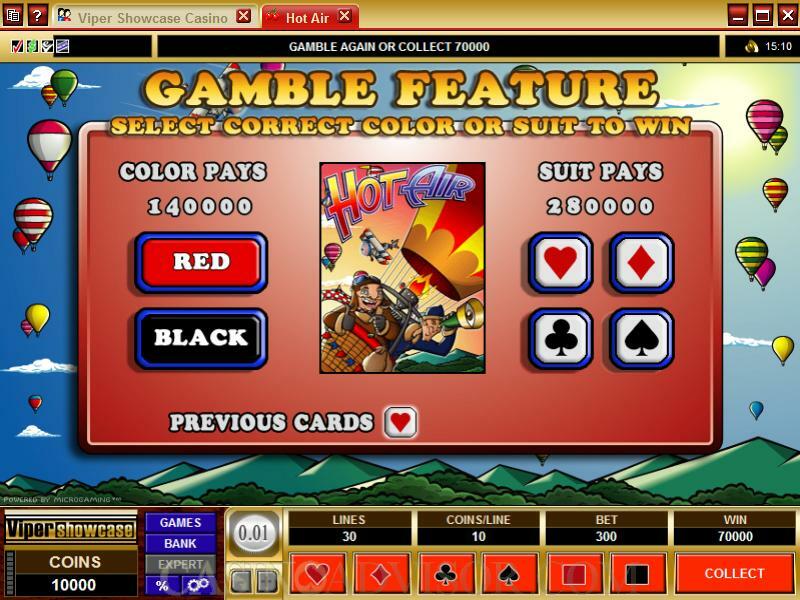 After each payout players have the option to collect their winnings or stake them in the Gamble Game. In the Gamble Game players have two choices. They can try to double the payout by choosing the color of the next card from red and black. Or they can try to quadruple their payouts by choosing the suit of the next card. If the players guess correctly then they enhance their staked payouts. If they guess incorrectly they lose the staked amount. Interested in reading more detailed information about Hot Air? If so Click Here for more details.